Vicky, our IT & Digital Programme Manager attended the Association of Medical Research Charities ‘Delving into Digital’ symposium in London, to speak about PCA’s collaboration with HealthBit.com and showcase our new patient support app. I spoke about how stressful and confusing it can be to have a terminal pancreatic cancer diagnosis and how we worked with tech start-up HealthBit to create an app to help people manage their condition. We spoke about the benefits of collaborating with a technology company and of our aims for the future of the App. Pancreatic Cancer Action is committed to saving lives through earlier diagnosis and to improving the lives of patients with the disease. We have ambitious ideas about how we use digital innovation to help us achieve these goals and were delighted to share them at this conference. At Pancreatic Cancer Action, we know how important it is that patients can have control over their own diagnosis and care. 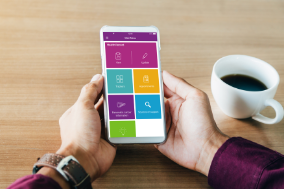 We created the Pancreatic Cancer Action Health App, using the HealthBit platform, to help people manage their condition and learn what has worked best for other people in their situation. Healthbit is a ‘next generation’ digital lifestyle tool for people to manage and understand their changing health. It provides health dashboards, connects to other apps and trackers, and it allows people to share their data with loved ones, carers and healthcare professionals. Also, by reporting and managing their data on the platform, patients contribute to something bigger, providing a data for more informed health research in the future. Pancreatic Cancer Action is one of the 140 members of the AMRC. The Delving into Digital conference brought together key sector players from government and technology companies to partner and collaborate with AMRC member charities. At the conference we explored the lifecycle of digital ideas, how initial concepts are brought to life, what challenges are faced throughout the process and just how these developments can make a huge difference to people’s lives.